(iii) how we correct for glacial isostatic adjustment (GIA). Exploring these aspects has shown us that the Bayesian Hierarchical Framework (BHM) is operating as it should and increased our confidence in the steric results it produces (figure below) and, as a global average, our steric results are now close to observational estimates (from Argo floats). Comparison of observed (top) and BHM-predicted (bottom) trend in ocean mass (left) and sea surface height (right) for the period 2005-2015. For each pair of plots, the trend value is given in the left-hand map and the trend error in the right-hand map. However, significant discrepancies continue to occur at a regional to local scales. As we are confident that the BHM is replicating observations, the implication is that signals at these scales are not well represented in the observational datasets (GRACE, Argo and/or altimetry). Deeper analysis of the different observational datasets has thus become an ongoing focus. Our initial work investigated the global salt budget study to understand if we could use it to improve estimates of ocean mass trends. Next, as part of BHM framework development, we are in the process of estimating steric sea level trends (due to temperature and salinity) for 2005-2015 on a global scale. Based on observations and prior knowledge about trends in sea surface height (SSH; from altimetry), GIA (from the ICE-6G forward model) and ocean mass (from GRACE), the residual SSH signal (i.e. altimetry minus mass) should reflect steric changes. 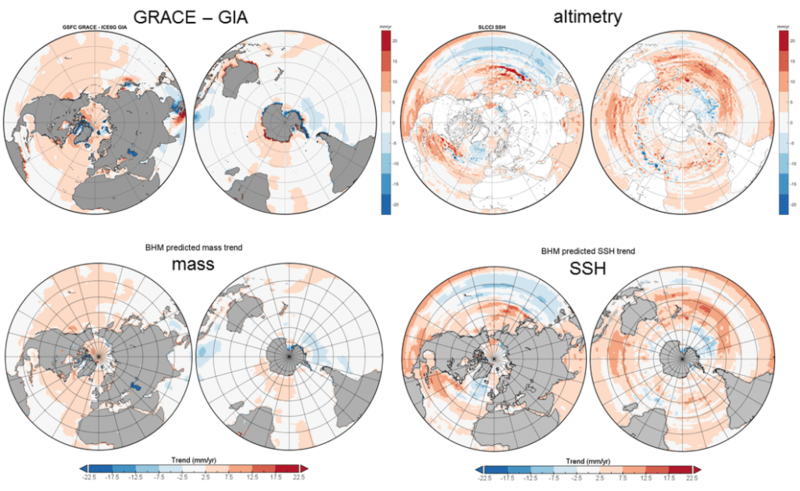 We will compare our solution with four established ‘steric trend’ gridded datasets to assess their performance, focusing on basin-scale trends and under-sampled ocean areas such as polar regions.